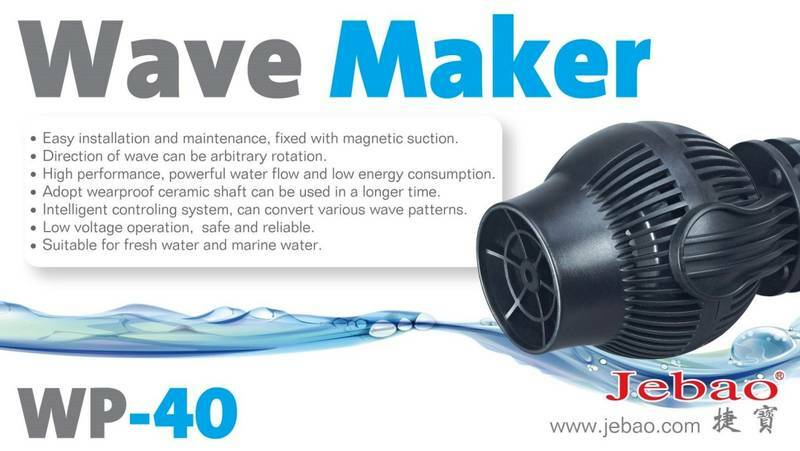 We are an official Jebao distributor for the Philippines. - Easy installation and maintenance. - 6 different operating modes, including variable pulse modes for wave generation and a Reef Stream mode that generates a random flow pattern similar to that found on a natural reef. - Night sensor - automatically detects when tank lights go out and slows the pump. - One-touch feed mode - slows pump for a period of 10 minutes. - High performance and powerful water flow combined with low energy consumption. - Intelligent control system to generate various wave patterns to suit your tank. - Extra-long cable for ease and comfort of placement. Even on larger tanks. - Low voltage, safe and reliable power supply. Press the 'MODE' button to cycle through the selection of functions. W1: Short pulses which, when timed correctly will create a back and forth motion and form a gentle standing wave in your tank. Adjust the controller to change the speed of the pulses and vary the size of the wave according to your tank. W2 & W3: Pump gradually speeds up and slows down incrementally to create a varied flow pattern. Adjustable to form the wave best suited to your tank. Else: Reef Stream Mode. A mixed, changing pattern that creates a random flow cycle similar to what you would find in a natural reef. Feed: Press the 'FEED' button once and the blue '10min' light will illuminate indicating that the pump has been stopped for 10 minutes. When the time has elapsed, the light will go off and the pump will be turned back on. Alternatively, press the 'FEED' button again to start the pump. Lock: To prevent changes from inadvertently occurring by accidentally turning the adjustable control knob. Press and hold the 'FEED' button for 5 seconds. The red 'LOCK' light will illuminate and the control knob will no longer function. Press and hold the 'LOCK' light again 5 seconds to disable this feature. *Night: When the two-pinned sensor is inserted into the two small plugs on the left-hand side of the control box, Night mode will function automatically. The sensor detects when the tank lights go out and slows the pump to half speed. The 'Sensor' light will illuminate when Night mode is in operation. To disable the Night mode function, remove the sensor from the control box. * Night mode is a new feature intended for use with low output lighting. The sensor can become damaged when used with high output VHO, HQI, and LED lighting systems.